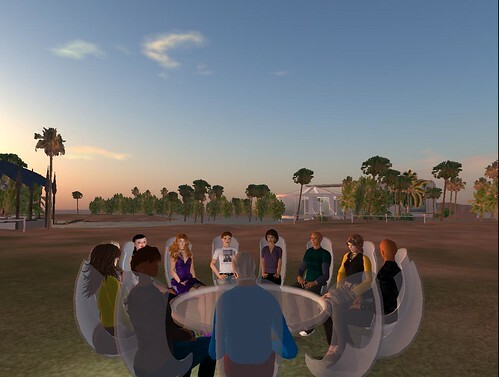 We had regular weekly meetings in SL for one and a half years and learned a lot together. We have also been collecting resources on the SLExperiments wiki like links to papers, books and articles related to teaching in virtual worlds. Meanwhile, many more language teachers have joined SL and through the SLanguages conferences I have met more teachers who had already been in SL much longer and had had experience with teaching. There were also some universities and SL “schools” offering language courses. However, most teachers seemed to work on their own. One interesting community was Second Life English, whose founder is Kip Yellowjacket and who has an island in SL which is dedicated to language teaching and learning and a web presence. Kip has been quite successful in creating a community of teachers and learners. Cypris Chat and English Village (which is probably the oldest community) have a similar concept and bring together teachers who want to learn teaching in SL with students who want to learn or practise their language skills. Then, there are the two EVO sessions VWLL (2009) and TLVW (2010) which brought several hundred teachers interested in language teaching in SL together and some stayed active and even started teaching after the session. (VWLL and TLVW Nings will cease to exist soon. We will move the content to our wiki, which we will make public soon). 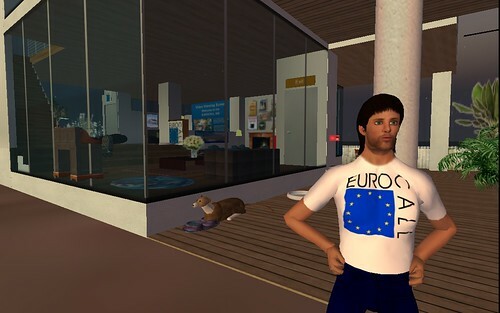 More organizations and universities have become interested in virtual worlds. This resulted in EUROCALL and CALICO to join forces and create a virtual presence in SL and online. Then, there are the EU-funded projects AVALON and NIFLAR. AVALON has a web presence and an island in SL. One of their aims is training teachers to teach languages in virtual worlds in a pedagogical sound way and to create a teacher community for continual support. It is wonderful to have so many individual teachers and communities in SL now. Many of us are members in several or all of these communities. However, there is also a downside, it is impossible for many of us to be active in all of them. So, recently, we have decided to bring the SLExperiments and AVALON members together and start having regular meetings twice a month at different times. We hope this will boost participation and help build a stronger community who can share their knowledge, test activities with peers, and share lesson plans and resources. Both communities and their platforms will continue to exist and members can, of course, have other meetings besides the two mentioned above. Do you know of other language teacher and learner communities in SL which should be mentioned here? Can you tell us a little bit about them? Are you a member of a teacher community in SL? If so, can you tell us what benefits it has has for you and what kind of activities you do?